Their new free dance to the Romeo and Juliet soundtrack is a departure from the style that we are used to seeing from them, but they are adapting well to a storytelling style. Their speed, passion and precision were evident in this free dance and set them in a class of their own. The team had beautiful lines and extension throughout their performance. The Italians Charlene Guignard and Marco Fabbri claimed their very first medal in a Grand Prix event. They are taking home the silver with a total score of 192.30 points. They gave a charming performance to the La La Land soundtrack. They did a wonderful job integrating the elements throughout the program in a cohesive fashion. Tiffani Zagorski and Jonathan Guerreiro from Russia had an innovative free dance. They skated to the “Blues for Klook” by Eddie Louis with power and commitment to the choreography. The team connected well to the music, leaned into their deep edges and had some fantastic lifts. Zagorski and Guerreiro earned an overall score of 181.38 along with their first medal at a Grand Prix event, claiming the bronze. 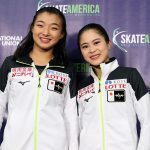 They were very happy about their performance especially since they were unable to perform a lot of full run throughs prior to the event due to Zagorski’s knee injury. American team Lorraine McNamara and Quinn Carpenter have made some wonderful strides this season. They moved across the ice with a great amount of grace and flow. This was a solid Skate America debut for this team. They earned a total score of 180.57 and finished in fourth place, while teammates Karina Manta and Joseph Johnson finishing in tenth.